German Immigrants in American Church Records - Vol. 25: Missouri (St. Louis VI); Edited by Roger P. Minert; Ph.D., A.G.; 2018; 513 pp; Hard Cover; Every-name index; Acid Free Paper; ISBN 978-1-62859-213-9; Item #FR0659. Please note that there is a 4,732-surname index to this book at the end of this entry. Wilhelmine Schallenberg b. Lienen, Warensdorf, Westfalen; m. St. Louis, MO 17 Oct 1857, Hermann Heinrich Krome. Ref: p. 4:62. Johann Helms b. Tramm, Crivitz, Mecklenburg-Schwerin; m. St. Louis, MO 17 Oct 1857, Dorothea Krueger. Ref: p. 4:62. Dorothea Krueger b. Langenheide, Wittenburg, Mecklenburg- Schwerin; m. St. Louis, MO 17 Oct 1857, Johann Helms. Ref: p. 4:62. Heinrich Ernst Carl Bang b. Hattorf, Fallersleben, Hannover; m. St. Louis, MO 25 Oct 1857, Therese Marie Boesewetter. Ref: p. 4:63. Therese Marie Boesewetter b. Zwickau, Sachsen (kingdom); m. St. Louis, MO 25 Oct 1857, Heinrich Ernst Carl Bang. Ref: p. 4:63. Conrad Broeg b. Marburg, Hessen-Nassau; m. St. Louis, MO 27 Oct 1857, Louise Lange. Ref: p. 4:63. Louise Lange b. Remscheid, Düsseldorf, Rheinprovinz; m. St. Louis, MO 27 Oct 1857, Conrad Broeg. Ref: p. 4:63. Christian Carl Gerling b. Minden, Westfalen; m. St. Louis, MO 12 Nov 1857, Anna Maria Johanning. Ref: p. 4:64. The first 18 volumes of this ongoing series were published by Lewis Rohrbach of Picton Press. 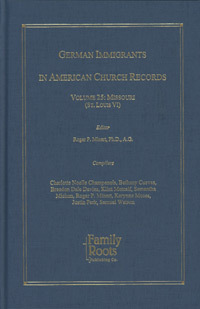 Following his death, Family Roots Publishing contracted with Dr. Minert to continue publication of the series - starting with volume 19, which also deals with Missouri church vital records. Volume 20 (St. Louis County and City I) was the first of a series dealing with St. Louis, Missouri church records. Volumes 21 through 25 are all St. Louis City entries. Holy Ghost Church, St. Louis, MO. The following 4,732-surname index was compiled from the 11,550 entries found in German Immigrants in American Church Records, Vol. 25.